Natural Pastures Comox Brie & Category 12 Saison: Admittedly, I am a huge fan of brie cheese (who isn’t right?) so you’ll likely see a lot of brie cheeses or similar varieties on this blog because I find them to be utterly delicious. For this pairing, my intention was to couple the spices from a Saison style beer with the earthy creaminess of brie cheese in an attempt to enhance the texture of the cheese by cutting into the fat while at the same time smooth out the beer. As with any pairing, there’s usually a few pleasant surprises along the way and I’ll get into those in the review below. I picked two independent companies from Vancouver Island, BC and enjoyed their products together on my patio during a sunny afternoon. 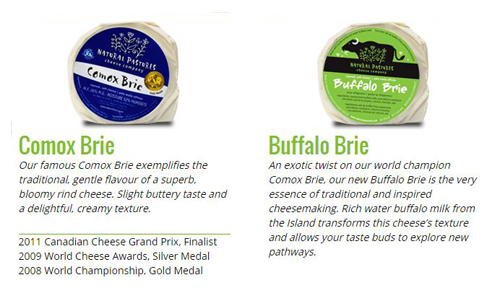 Overview of the BC Cheese Makers and Brewers: The Natural Pastures Cheese Company is located in Courtenay, BC which is an Island town with a population of approximately 24000 people. Sprouting from a heritage dairy farm, according to their website they started their artisan cheese shop back in 2001. Within a year the owners attracted a Swiss Master Cheesemaker named Paul Sutter into small town BC living to help bring them to where they are today. They feature not only fresh Island cow’s milk, but also water buffalo milk in some of their cheeses. Category 12 Brewing is located in 15 minutes outside of Victoria, BC just off the main highway that primarily serves as a go between from the BC Ferries terminal to downtown Victoria. They are a very new “lab” themed brewer who makes excellent beer so next time you take a ferry to or from Victoria, be sure to stop in and grab some growlers or bottles from their storefront – it’s a perfect way to break the ferry rush hour traffic! 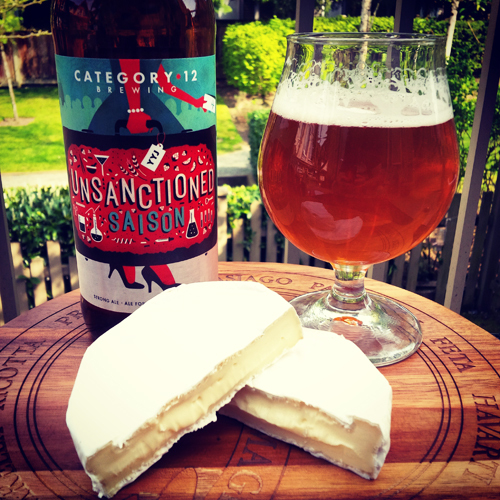 The Beer: Unsanctioned Saison by Category 12 Brewing is a great saison, which is a beer style that is getting some well deserved notoriety in North America. It has a grassy herbal and pepper spice aroma, with flavour notes of cloves, cereal grains, herbs, lemon pepper, straw, yeast and a floral overtone that makes it perfectly delicious. 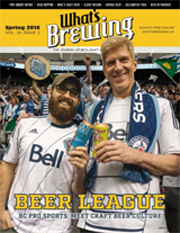 They brew it to a strength of 6.9% abv with 27 IBU’s featuring zythos hops, a Belgian yeast as well as some Pilsner malts, Belgian specialty malts and a hint of rye. This is one of the best BC saisons, no doubt so be sure to try it next time you see it in a private liquor store. The Cheese: Named Comox Brie, this cheese has 28% milk fat and 52% moisture, giving it a soft creamy and buttery texture. It has won multiple awards, including a very recent 2015 Canadian Cheese Grand Prix Award for Best Soft Cheese with Bloomy Rind, after tasting this I can see why it won. The brie has a pungent aroma featuring a general horse blanket farm funk overtone with earth, butter, and quaffs of basement mold (remember, generally with cheese the stinkier the better!). For the flavour, I got huge earth notes, farm house funk, a big creamy texture and slightly crunchy grassy rind that was very well balanced and exquisite on my palate. The Pairing: One thing I love about pairing yeasty spicy beers with brie is that the creamy texture erupts into higher levels of savoriness. 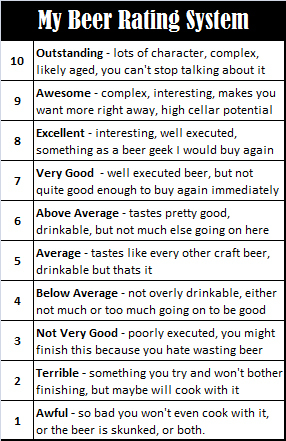 This one blew my mind as to how far up the creaminess scale a cheese could go when paired with beer! The brie developed into a silky smooth creamy textured mouth bomb that ultimately made a few accidental foodgasm noises emanate from me as I ate it (sorry neighbors! ).Furthermore, some hidden salty and savory butter notes were exposed, the rind was tamed while surprisingly the farmhouse funk stood out while the more prominent grassy earth flavours hid in the background. For the beer, I noticed a lot more straw and hay from the pilsner malts, with some subdued spice and I experienced an unexpected creamier mouth feel from the beer, which upon reflection was likely carried over by the cheese texture. Overall, the herb and spices noted in this saison almost infused themselves into the brie and create whole new mixes of flavours that you sometimes get in a herb brie or pepper goat cheese, but in a softer more balanced form. Overall Rating: Awesome at 9/10, any pairing that makes you stop sensing everything else around you and focus on the food and drink experience is something that imprints on your mind and palate for a long period of time. This one was up there and I’d be happy to induce multiple foodgasms by trying them together again and again! Be sure to watch this video feature Paul Sutter talking about is his passion for cheese and family, it’s infectious in a good way!